Funasset integrates a mailing solution for Maidstone and Tunbridge Wells NHS Trust that streamlines mail production and cuts associated costs by 45%. Maidstone and Tunbridge Wells NHS Trust (MTW) is made up of Maidstone Hospital and Tunbridge Wells Hospital. Like all NHS Trusts, it posts thousands of mail pieces such as appointment letters and associated leaflets to patients each year. MTW were looking for a supplier to assist in the process of volume mailing. The trust’s mail output had increased in recent years to the point where the cost of processing patient letters was no longer economical. MTW decided to use a leading UK hybrid mail system to fulfil its mailing requirement. However, due to NHS N3 network security restrictions it was not possible for mail to be transmitted to a third-party offsite facility. Funasset were therefore instructed to provide a single and secure point of connectivity and a user interface for MTW staff. Funasset integrated its hybrid mail solution at MTW so mail could be composed and managed by staff then transmitted via the NHS N3 network to a leading UK hybrid mail system or a Xerox SDC for printing, finishing and posting. Prior to being transmitted, Minkz Mail checks each address and post code for accuracy, sorts mail and, if necessary, combines it. An electronic copy of a patient’s letter is also optionally sent to their GP/consultant via the NHS Docman system. Not only does the hybrid mail solution provide a user interface for MTW staff, it also allows the NHS Patient Administration System (PAS) to transmit letters and associated supplements (such as maps and leaflets) to a print and finishing depot. 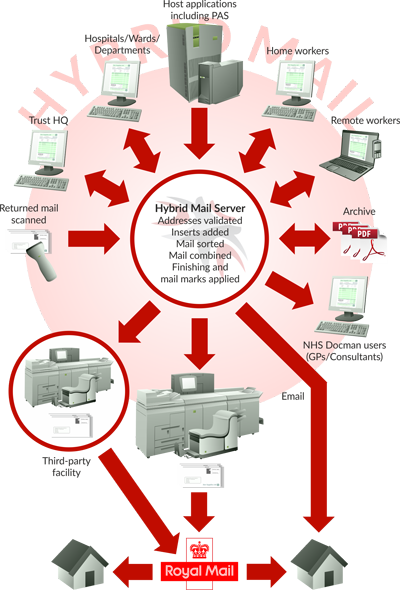 Prior to integrating hybrid mail this was unachievable due to security implications of the NHS N3 network. "Using our hybrid mail made it possible for us to transmit our mail to third-party print and finishing facilities like a Xerox SDC." Mail can be transmitted to third-party offsite printing and finishing facilities via the NHS N3 secure network. The address and post code of mail is checked for accuracy so undeliverables and returns are minimised. A folder inserter 2D barcode is applied to mail to ensure its integrity. Mail is sorted so the best Royal Mail bulk mail discount is attained. 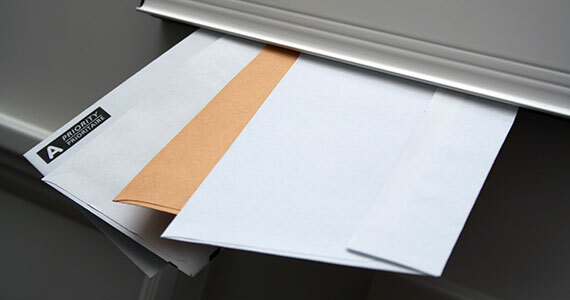 Mail destined for the same recipient is combined in the same envelope resulting in reduced mail volume and costs. Mail assets such as maps and leaflets are automatically included with patient letters when necessary. With printing and finishing being performed at third-party facilities, MTW staff have more time to perform other duties and core tasks. Existing patient management processes, applications (including PAS) and letter templates can continue to be used without change. Web and desktop interfaces mean MTW staff can compose and manage mail from almost anywhere. Dynamic insertion of paragraphs and footer information means reduced letter composition work for MTW staff. Integration with the NHS Docman system means patient letters no longer need to be posted to GPs/consultants. Comprehensive reports enable valuable information such as mail volume to be accessible by MTW staff. The ability to have mail printed and finished at multiple print centres ensures resilience. ISO 27001 certified solution and supplier means NHS data security requirements are adhered to. Do You Want to Reduce Your Mailing Overheads? Please use our contact form or call +44(0)1823 365864 if you would like to discuss how Funasset can help you significantly reduce your mailing overheads. Your Funasset account is being created. Please wait! You have successfully signed-up for a Funasset account. This enables you to buy and license certain software and submit support tickets. Submit your email to reset your account password. You have been sent an email to reset your account password. If you are unable to find it, please check your junk/spam folder.